Ethical Art has written an article on the Women of Buddha Exhibition for the Urthona Magazine – an international magazine on Buddhism and the arts. See below for the full article. From November 29th – January 31st the Cambridge Buddhist Centre is hosting an exhibition of photographs by Danish photographer and journalist Marie Venø Thesbjerg. The stunning series of photographs titled “Women of Buddha” were taken when Thesbjerg was working in Bhutan in 2005 for an international aid organisation. She fell in love with Bhutanese Buddhist Culture and particularly the nuns of Bhutan. While the government actively supports the Buddhist monks, the nuns do not receive any financial assistance and therefore often live in very poor conditions without access to education and proper housing. To address this imbalance, the Bhutan Nuns Foundation was established in 2009 and is the sole organisation supporting the nunneries. 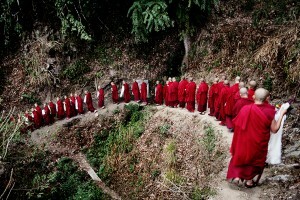 All proceeds from sales of the photographs in the exhibition go to the Bhutan Nuns Foundation. Cambridge Buddhist Centre held an opening night event on November 29th where we heard talks from Marie Venø Thesbjerg and also Buddhist Nun and former Cambridge graduate Ani Pema Deki (formerly Emma Slade). Ani Pema Deki spoke about her unique journey that has taken her from working internationally in Investment Management to meeting her Bhutanese Lama (teacher) and spending much of her time now studying in Bhutan. The exhibition is a travelling exhibition of works and is available for other Triratna Centres to host. To see the full collection of images in the exhibition visit www.ethicalart.org or contact gro.tralacihtenull@anna. Copyright © 2013 – 2019 Ethical Art. All rights reserved.